CPN Audio Visual can take your event to the next level with dramatic lighting and drapery. Add drapery to cover up awkward distractions behind your stage and presenter. Drapery adds a professional look that ensures your audience focuses on the center stage. The finishing touch is lighting! Never underestimate the power of dramatic lighting. Whether for ambiance in and around the event or specifically for stage; CPN will make your event special, classy, and impactful. Let us give your event a professional dramatic look. We can provide spotlighting, cross lighting, up lighting, area washes and many other types of creative lighting effects. We have state of the art LED lights as well as traditional lights. 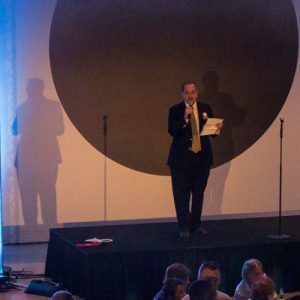 When general overall illumination is required, whether it be the outdoor cocktail receptions, silent auction tables or registration areas, area lighting helps create ambiance and set audience expectations for a classy event. 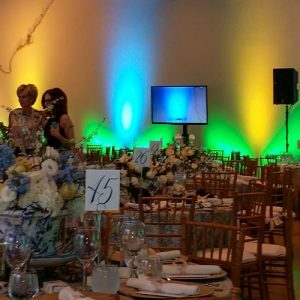 Add color to every event with dramatic up lighting. 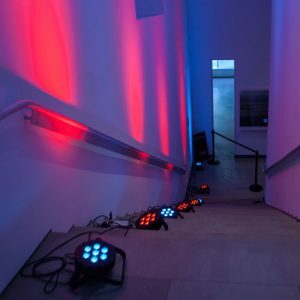 Let us know what your preferred color theme is and we will program our multi-color LED lights to match or compliment your overall event theme or brand. Lighting helps direct focus towards the stage with pleasantly attractive results, especially when viewed upon our velour drape backdrop. Don’t forget to light your presenter! These lights are usually used in pairs to ensure adequate illumination from different angles of view from the audience. These “ellipsoidal” lights are also used for GOBO applications, call for details on having a custom GOBO prepared with your logo. We also have battery powered wireless lights for even more creative positioning. 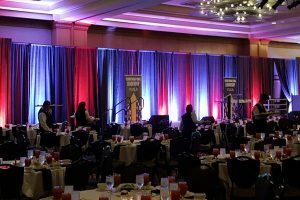 With or without lighting, pipe and drape helps set the scene for events and projection screens. We can set up multiple section of 10ft each at heights up to 20ft to create a soft looking background. Drape is a standard accessory we offer with all of our projection screens giving them a more finished look instead of a bare screen with metal supports. Drape is also an effective noise buffer between two adjoining areas. In many occasions we light drape with colored stage lighting and gobos to create stunning visual effects. Choose from several drape colors including black velour, gray, white, silver and blue and add up-lighting to create ambiance and drama.